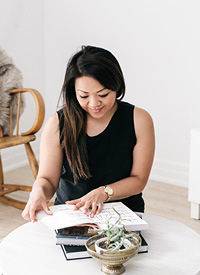 Less Than 5 Days Until Christmas — Love On Sunday Love On Sunday | Interior Styling in Toronto and the GTA. Are you ready? I'm almost there. 3 more presents to buy as well as baking and wrapping to be completed. It will definitely be a hectic few days up until Christmas. But I'm not complaining, I love every minute of it. Also, I just came home from buying an 18lb turkey. Who the heck picks an 18lb turkey for their first attempt at Christmas dinner? Apparently, I do. Every time I think about cooking this gigantic bird I remember that dinner scene from National Lampoons Christmas Vacation. I took the liberty of including the clip below in order to fully illustrate what has been going through my mind the past couple of weeks. Oh, and if you haven't seen National Lampoons Christmas Vacation PLEASE go watch it. It's hilarious! Below are a few images of Christmas around my home. Loving my new feather wreath from West Elm!